In the previous article (http://ponnadi.blogspot.in/2013/07/anthimopaya-nishtai-16.html), we observed the glories of srIvaishNavas irrespective of their birth. We will continue with the next section where we see srIvaishNavas being glorified by emperumAn, AzhwArs and AchAryas and some incidents from our pUrvAchAryas lives which demonstrate the same. bhagavAn himself highlights the glories of srIvaishNavas in many occassions. Simple translation: It is those some devotees of mine who ward off the upcoming danger like rain clouds quelling the heat of fire. Simple translation: A gyAni who is fully devoted to me is my soul - this is my opinion. Simple translation: A gyAni who is devoted to me has so much attachment towards me - me too has the same (actually more) attachment towards him. Simple translation: pANdavas are like my life breath. Simple translation: I follow forever and accept the dust of the sage's lotus feet, who is without desire of selfish benefit, who is peaceful, who is without enemies, who has the vision of equality towards all souls. Simple translation: My love for my devotees is too great, so it is very special and dear to me when my devotees are worshipped. Simple translation: O kamalOdbhava (brahma - born in a lotus flower)! I first partake the food offered to me by sight and then enjoy it through the tongue of my devotees. Simple translation: My bhakthas essentially have the following eight qualities - 1) unconditional love for bhakthas of emperumAn, 2) enjoying (others) worship of emperumAn, 3) worshipping emperumAn him/herself, 4) being without any pride, 5) having attachment in listening about emperumAn, 6) having bodily changes (like goose bumps, etc) when hearing/thinking/speaking about emperumAn, 7) always thinking about emperumAn, 8) not asking material benefits in return for worshipping emperumAn. Such bhakthas even if they are mlEchchas, they are worshippable at par with my own self by leaders of brAhmaNas, the meditators, the ones involved in kainkaryam and even sannyAsis and scholars. They are also eligible to give and accept knowledge from such scholars. Simple translation: The aim of eyes is to see great bhAgavathas; the aim of our body is to be touched by great bhAgavathas; the aim of our tongue is to glorify great bhAgavathas; Such bhAgavathas are rare to find in this world. Simple translation: I am incapable of speaking of the greatness of those who are devoted to bhagavAn. The Lord alone knows their greatness and they alone know His. AzhwArs also glorified the bhAgavathas and identified that yamabhatars (servants of yama dharma rAjan) has no control over them. Simple translation: yaman to his servants "Dont ignore this instruction. When you see srIvaishNavas who could even forget bhagavAn's names but never worship other dhEvathAs, you worship them, treat them with get respect and become purified". (Translator's note: Typical example given is - when there is disagreement between husband and wife, if the wife does not speak to the husband that is even accepted, but if she looks out for another man, that is totally unacceptable). Simple translation: Whatever may be their actions, srIvaishNavas are my masters since they are devoted to srIman nArAyaNan. Even yamabhatars are not qualified to analyse the defects of srIvaishNavas who are totally surrendered to bhagavAn who is lying on AdhisEshan and appeared as a cow-herd boy. Simple translation: I have witnessed the singing and dancing of abundance of bhAgavathas who are totally surrendered to bhagavAn who is most potent like the sea (which is filled with pearls, etc) and is most beautiful in sea-like bluish hue. Because of these bhAgavathas, the ignorance in the mind of people is vanquished. Since the ignorance is gone, there is no work for yama and his servants who punish the ignorants at hellish regions. The underlying reason which is the defects of kali yugam is also gone. Let this auspiciousness stay for ever. thuLLu nIr meLLath thuyinRa perumAnE! துள்ளு நீர் மெள்ளத் துயின்ற பெருமானே! Simple translation: Oh my lord who is lying on AdhisEshan in kshIrAbdhi (milk ocean)! Oh the master of thirukkaNNapuram (right in front of me)! When yamabhatars see your devotees, they go in hiding just life robbers would hide from others. AzhwArs (thoNdaradippodi AzhwAr) declare that "nAvalittu uzhitharuginROm namanthamar thalaigaL mIthE" (நாவலிட்டு உழிதருகின்றோம் நமன்தமர் தலைகள் மீதே - We make a victorious sound and walk over the heads of yamabhatars). 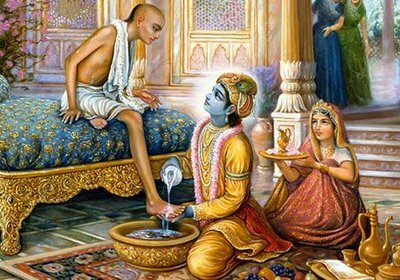 Thus AzhwArs establish that not only yamabhatars can look at srIvaishNavas to control them, they will also suffer severely if they try to engage in such acts. Such are the glories of srIvaishNavas. "na kalu bhAgavathA yamavishayam gachchanthi" (ந கலு பாகவதா யமவிஷயம் கச்சந்தி - bhAgavathas and yama have nothing to do with each other) also explains the glories of bhAgavathas. In this matter, the following slOkam explains the dealings of yama, etc with bhAgavathas. Simple translation: yama invites his sevants closer and secretly explains to them that he is not the master of srIvaishNavas who are surrendered madhusUdhanan but others are under his control. He also tells them to be neutral towards srIvaishNavas and stay away from them since they are surrendered to bhagavAn who is known as lotus eyed (kamalanayana), vAsudhEva, visNu, dharNidharan (who holds the world) and the holder of sankam (conch) and chakram (disc) in his hands. 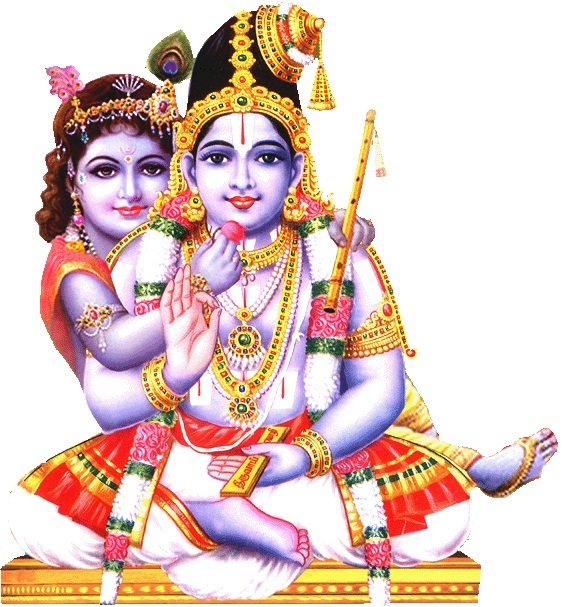 Thus yama dharma rAjan instructs his servants that they cannot control srIvaishNavas and asks them to stay away from srIvaishNavas to protect themselves from the anger of bhagavAn. All these glories about bhAgavathas are explained in srIvishNu purANam, etc. Mixing with abhAgavathas will lead to separation from bhAgavathas and bhagavAn. Mixing with bhAgavathas will lead to union with bhagavAn, separation from abhAgavathas and will ultimately lead one to salvation. For the ones who stay under the supervision of a true AchAryan, they will never be bewildered about samsAram. 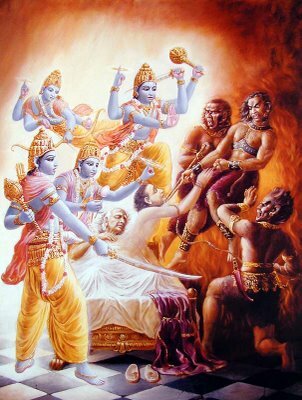 But when the sishya moves out of such supervision, he will be eternally suffering in this samsAram. This is explained by AchAn piLLai in mANikka mAlai. Thus, for a sishya, everything should be under the disposal of his AchArya. Instead, out of bewilderment, if he forgets the relationship with AchArya and out of his own accord if he indulges in akruthya karaNam (engaging in activities that are rejected in sAsthram), bhagavathapachAram (offending bhagavAn), bhAgavatha apachAram (offending bhAgavathas), asahya apachAram (reasonless offense towards bhagavAn-bhAgavatha) and as a result will become eligible to suffer in hellish regions such as raurava hell, etc. True AchArya, out of his causeless mercy, contemplating on the sufferings they have to go through, will purify even such fallen sishyas as identified in "payananRAgilum pAngallarAgilum cheyal nanRAgath thiruththip paNi koLvAn" (பயனன்றாகிலும் பாங்கல்லராகிலும் செயல் நன்றாகத் திருத்திப் பணி கொள்வான் - kaNNinuN chiruthAmbu 10 - madhurakavi AzhwAr says Even when I was of no use and totally immature, nammAzhwAr reformed me and engaged me in his service) - this is the quality of a true AchArya. This principle of causeless mercy of AchAryas is explained through a few incidents in the lives of our pUrvAchAryas. It is due to this causeless mercy, when kUrathAzhwAn's sishyan nAlUrAn joined with kirumigaNtan in committing the biggest offense towards AzhwAn (who is nAlUrAn's AchAryan), perumAL becomes very upset with him and says "na kshamAmi" (I will never forgive you). 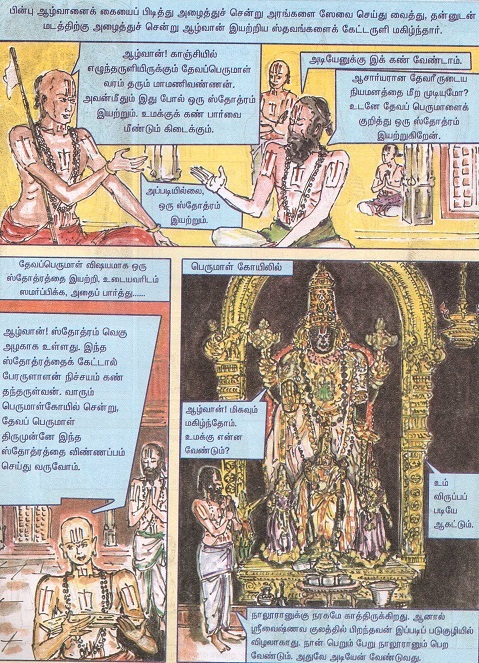 But AzhwAn disagrees with perumAL and requests him that "nAlUrAn should get the same lOkam (paramapadham) like myself". When one of the sishyas of bhattar becomes bewildered due to undesirable friendship, becomes very materialistically attached tells bhattar "bhattar! we have no relationship anymore" and tries to leave the lotus feet of bhattar. bhattar tells him "dear son! you may think like that. Even if you give up my relationship, I will not" and reforms him again. nanjIyar the vEdhAnthi had a sishyar who was very dear to him, was very detached and was totally filled with auspicious nature. 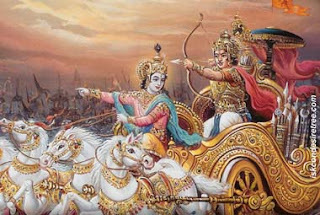 But due to consuming defective food, his ego, etc., raises and picks up the spear which he had before taking shelter of nanjIyar and goes back to serving the king. nanjIyar some how catches hold of him and brings him into a room in privacy and shuts the door to give him good instructions. 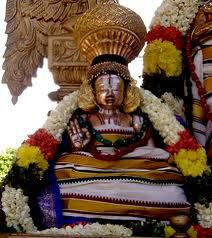 srIvaishNavas who are attached to the lotus feet of nanIyar becomes worried and say "Oh! this is bad; nanjIyar should immediately leave the room where the man is with a spear in his hand which could be used to attack him". nanjIyar replies "I will not leave until he becomes purified; Either he should understand his spiritual position and be uplifted or I die at the hands of him by his spear". piLLai lOkAchAryar says in srIvachana bhUshaNa dhivya sAsthram that towards the ones who commit offenses against oneself, one should have poRai (compassion), krupai (mercy), chirippu (smile), ugappu (joy) and upakArasmruthi (gratitude). Not only that, he also personally conducts himself in the most dignified way and is the ultimate example of how a srIvaishNava should be. Simple translation: A good AchArya accepts everyone even those with no goodness. The blemishes of the accepted souls after that are removed by teaching them the knowledge of the AthmA and corresponding anushtAnam (practical implementation with discipline). Simple translation: Just as the whorls of an immature lotus do not blossom by the rays of the sun, so also the acharya considers that the defects of the sishya are because of the shortcomings in maturity and not because of him (Considering that the sishya has to mature in knowledge, discipline, etc., the AchArya reforms him instead of rejecting him as bad). 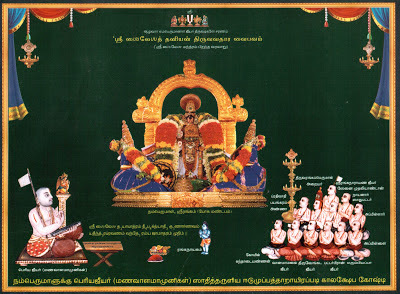 As identified in the above slOkams, even if a sishya is surrendered to an AchArya, due to his lack of knowledge/conviction, again engages in undesirable activities to destroy ones own self, AchAryas would reform them and protect them out of their instructions as said in "skAlithyE sAsithAram" (ஸ்காலித்யே சாஸிதாரம் - correct the sishya by giving good instructions when he is committing mistakes) and their overwhelming mercy as said in "dhEsikO mE dhayAlu:" (தேசிகோ மே தயாலு: - AchAryan is most merciful to me). Simple translation: Those who are well versed in the vedhas regard the very life of prapannas (totally surrendered devotees) of vAsudhEva as the dharma sAsthram. All these special qualities of our pUrvAchAryas are fully manifested by our AchAryan (mAmunigaL). When he was resting in the OlamEchchAn mutt (a thatched hut) in AzhwAr thirunagari, evil hearted persons (like those chaNdAlas who poisoned the food given to emperumAnAr himself) who are jealous on mAmunigaL, in the middle of the night, sets fire to the mutt (Translator's note: mAmunigaL sneaks out in his AdhisEsha form from the burning mutt and stands outside eventually watching the burning mutt). The local administrators search out for the miscreants to punish them severely for their most henious crime. But, mAmunigaL as identified in the following pramANams, disagree with the administrators, forgive the miscreants and set them free (Translator's note: mAmunigaL is compared to sIthA pirAtti here who was most gracious and kindest towards the ones who harmed her - similarly mAmunigaL also showered his mercy towards the ones who tried to kill him and ultimately reformed them as well). Simple translation: sIthA pirAtti to hanuman - Oh hanuman! Kindness is to be shown by a noble person either towards a sinner or to a virtuous person or even to a person who deserves death, for, there is none who never commits a wrong. Simple translation: sIthA pirAtti to hanuman - Who will be angry with servant-maids who are just performing per their master's orders? Thus, mAmunigaL the most merciful AchArya, ensured that even those most fallen souls are not punished by the administrators - this incident is well known everywhere. 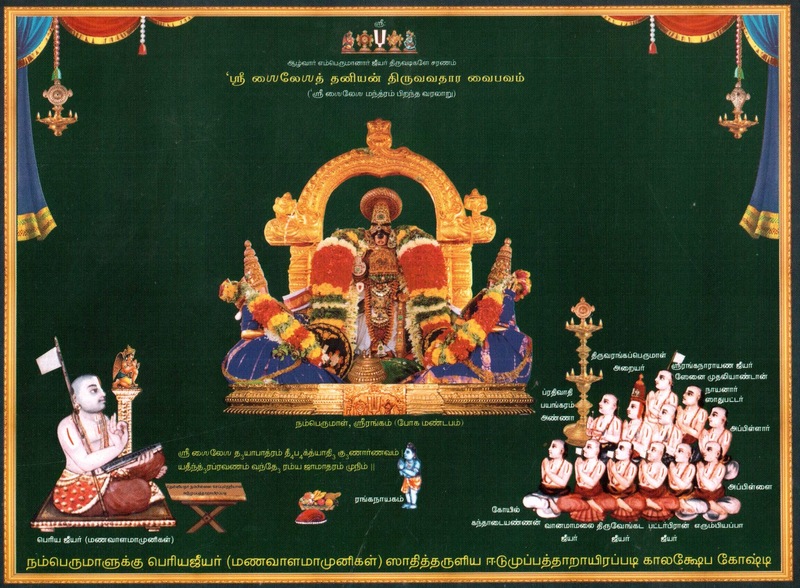 Further our AchArya's most merciful nature and his avathAra visEsham (special nature of him being the incarnation of AdhisEsha and the second coming of srI rAmAnuja) could be understood by the incidents involving mangoose and parrot, vruksham (mAmunigaL blessing a tamarind tree with mOksham) and the many svapnams (dreams) of great personalities (like kOilaNNan, sAdhu srIvaishNavas in thiruppathi , etc - where many fore-see the greatness of mAmunigaL). Translator's note: Thus, we have seen the divine glories of srIvaishNavas as identified by emperumAn, pirAtti, AzhwArs and AchAryas and some incidents which reflect the same. We also observed the unconditional kindness shown by sIthA pirAtti and mAmunigaL towards the ones who troubled them. We will now see the concluding section of this divine grantham. We will see the concluding section of this wonderful grantham in the next article.